Allows ANY of our Sanke or Speidel fermentation kits to serve contents through a Ball Lock Liquid Out connection. Do you own one of our Sanke keg in-keg fermentation kits, or one of our Speidel in-tank fermentation kits? (This applies to ANY of our items that feature an adjustable sliding racking cane, including SKU numbers 2825, 2846, 2961, 2958, among others). Wouldn’t it be nice if you could serve right out of the Sanke keg or Speidel tank without buying a separate Ball Lock Serving Connect setup (Item #3009)? This Ball Lock Serving Cane is your answer! 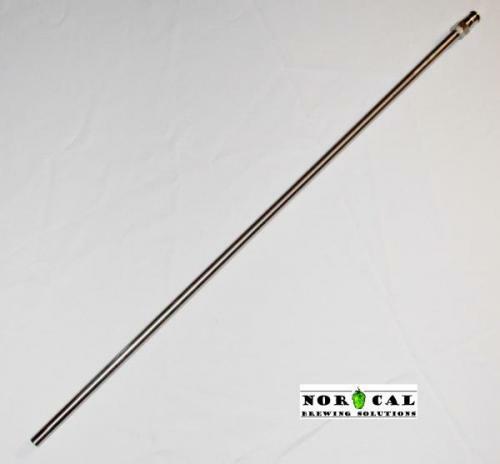 This Serving Cane works with ANY of our fermentation kits listed above. You simply pull out the Racking Cane portion of the item you already own and slide in this inexpensive Serving Cane. All ancillary components connected the rest of the device – be it the Cross, the Tee, and everything connected to those items – stay in place and work as before. The ONLY thing that changes is that the top of the racking cane now becomes a Ball Lock Liquid Out connection. This allows you to connect your Sanke keg or Speidel fermenter to any Cornelius (Corny) based serving system. Yes! You can serve whatever liquid you have – whether force carbonated or not – through whatever draft system you have in place that uses Ball Lock Liquid Out as the connection! From picnic taps to all-out draft systems – you are good to go! Very helpful when added to Sanke adapter sold here to convert the Sanke keg fittings to a completely home-brew friendly ball and lock connection for both gas and liquid. Very pleased would recommend and order again. High quality as always from Nor Cal.